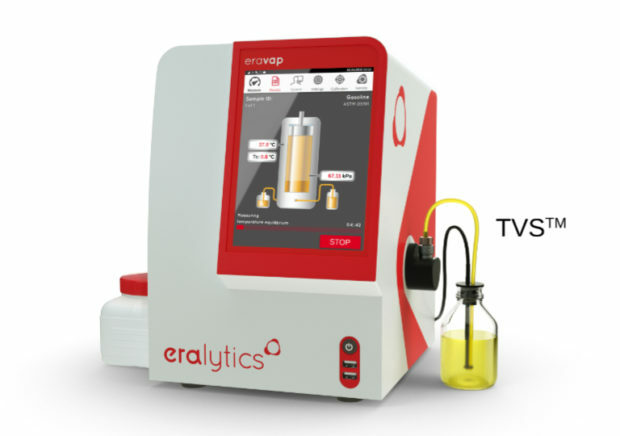 eralytics latest innovation (patent pending) for the vapor pressure tester ERAVAP is the TVS™- ASTM D5191 Temperature Verification Sensor for high precision vapor pressure testing of gasoline. This all-new temperature sensor allows easiest monitoring the temperature directly in the sample container, thus featuring an immediate check of the sample preparation even before the actual measurement starts. Especially when measuring quality control samples, accumulated results outside the tolerance limits will cause the instrument to be unnecessarily re-calibrated. TVS™ is a perfect tool to further improve the quality control in your testing lab. TVS™ facilitates complying with vapor pressure limits in fuel specifications. Especially for gasoline blending applications, it reduces the risk of exceeding these vapor pressure limits as the bias can reach up to 3 kPa (0.44 psi). Easy comparison of obtained results throughout the entire process chain. The measured sample temperature is stored in the result file for a convenient later review or data output via LIMS or printer. Curious? Just send an e-mail to office@eralytics.com, we are happy to answer all your questions.